Farewell to Green House class of 2018 – Always have strength in unity. 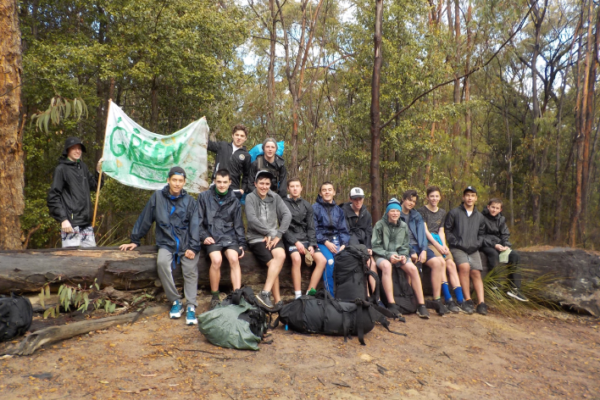 As we farewell our year 12 Green students, I can’t help but look back at the journey they have travelled in their time as Waverley College Students. For some it is a journey that began in 2011 at the junior school, while welcoming many others at the start of year 7 in 2013. It has been a journey of many triumphs, adversity and success. The men they have become is a testament to the support the students have received from parents, guardians, teachers, friends and multiple other influences in their life. We have been lucky, as a school to be an important part of their story so far, and know they will have success wherever the seek to travel and wish them all the best in their future endeavours. I must make a special mention to all the Green House Mentors that have supported our year 12 students during their final year. The support the teachers have provided has made the success of each boy possible. I would also like to mention all the parents for the education you have provided our year 12 boys. By choosing Waverley College, the boys have become learners, social justice advocates, sportsmen, debaters, friends, and transitioned to adulthood. I want to praise all the efforts that every student has provided to Green House and Waverley College in their time at the school. They have each had a positive impact on the school somewhere in their journey and the school is now a better place for having them come through. As a house, we wish you all the best with your exams and thank you for your service to Waverley College. I want to make a special mention to my year 12 leadership team this year. We were lucky to have 6 leaders in Green House this year. They were exceptional in their support of the programs we ran and we were very lucky to be blessed with such capable young men that will no doubt be future leaders in their careers/lives after year 12. Thank you very much gentleman for your incredible work this year. Our year 10 students engaged in the year 10 dinner dance this term. After a three course meal the boys spent the night dancing with friends and partners. A joyous celebration as they enter into their senior years of schooling. Congratulations to our year 9 campers from this term. From all reports it was a successful experience for all involved. I would like to thank Matthew Johnstone for his support in taking the group. I also wanted to thank the fathers that came out for the father/son component of the camp. This term our junior school students engaged in a variety of exciting events. Thanks to all boys for actively taking part in the events listed below. We have a very bright future in Green House with the students coming through from our junior school. I also want to thank Stephen Ghattas and Gabrielle Bransby for their support in setting up the farewell cards for our year 12 students on our last assembly. Our points of emphasis this term for our wellbeing time was about making a contribution to the Common good and making a positive difference in the lives of those less fortunate than ourselves. “Be the best version of me” Helps us to identify and celebrate what is right with us. Throughout this term we challenged all students to reflect upon our most positive attributes; both individually and collectively. Then reflect, when do Waverley boys do their best work and how can we do more of it and more often? We adopted a strengths based approach as we focus on what is right with us. This will also enable us to see the positive in our relationships with others and indeed the world around us more readily. Identifying and building upon these personal strengths is not to deny the presence of negative emotions or negative experiences but rather see this challenges as an opportunity to develop new skills resources and aspects of our character. Thanks to all the mentors for running through our wellbeing curriculum this term. Next term Green House will be taking part in our annual fundraising events as a house for White Ribbon Day. We will be running annual events next term leading into our final big event of the White Ribbon Day walk. All these events will be compulsory for Green House students next term, I would like to encourage all parents to participate in these events as well. Have a wonderful and relaxing holiday break.